Advocate for entrepreneurs Boris Titov proposes an amnesty for businessmen guilty of economic crimes that would grant Khodorkovsky his freedom back. Business ombudsman, Boris Titov, has proposed that the State Duma declare an amnesty for businessmen convicted of economic crimes for Entrepreneurs' Day on May 26. 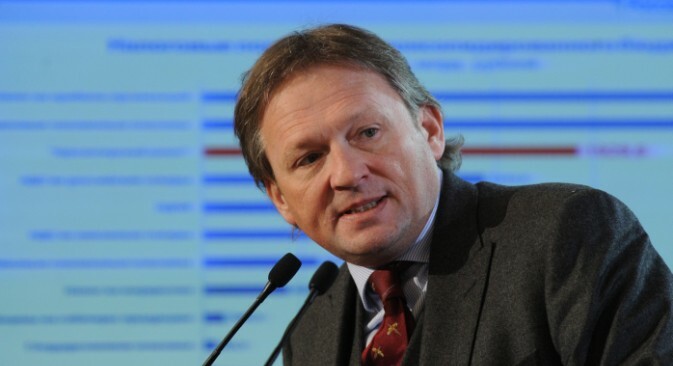 According to Titov, the amnesty will guarantee "a stable and growing economy." Such an amnesty would see Mikhail Khodorkovsky walk free. At present, 110,924 individuals are serving time for economic crimes, according to members of the ombudsman's advisory council. They estimate that 53 categories of economic crime would fall under the amnesty. The most controversial would be crimes under articles 159 (fraud), 160 (embezzlement), and 165 (causing damage to property by deception or abuse of trust) of the Criminal Code. Titov explained to Kommersant that amnesty is the way "to turn over the page of history that was written in the wild 90s." According to Titov, that was when "the rules of the game were spelled out not in law, but in notions." He thinks the last decade has not made life easier for Russian businessmen despite that "work to humanize criminal legislation in the economic sphere has been partially carried out and the tax laws amended to encourage transparent business schemes." Criminal prosecution under "made-to-order cases" has, in his words, become a means to "seize property." In 2009-2012 alone, "no fewer than 600,000 people were arraigned, resulting in 110,924 convictions." In many cases, they were brought to justice "without the victims being present." The proposed economic amnesty could arouse the Kremlin's interest given that it relates to articles of the Criminal Code cited in the charges brought against the former head of Yukos, Mikhail Khodorkovsky. The State Duma and the ombudsman's inner circle have declined to comment on that point. The ombudsman's advisory council hopes that Mr. Khodorkovsky will not be an obstacle in securing a widespread amnesty. The head of the State Duma Committee on Criminal Legislation, Pavel Krasheninnikov, told RIA Novosti that the business ombudsman's proposal could find backing. "For me, it is obvious that most of those convicted for economic crimes should not be in prison. The articles need to be amended to introduce heavy fines in lieu of jail time, even if the sentence is short," he added. Chairman of the State Duma Committee on Economic Policy, Innovation Development and Entrepreneurship, Igor Rudensky (United Russia), described the initiative as interesting but in need of serious consultation. Earlier, President Vladimir Putin signed a new law on the protection of entrepreneurs' rights in Russia. The document defines the legal status, main tasks, and competencies of the federal and regional business ombudsmen. It is presupposed that their main tasks will include protecting the rights and legitimate interests of entrepreneurs, monitoring the compliance of state bodies and local administrations in respect of such rights, assisting the development of social institutions aimed at protecting the rights of entrepreneurs, interaction with the business community, and participation in the drafting and implementation of relevant government policy.